Following the set international quality standards, our deft professionals are manufacturing, supplying, distributing and exporting SAF Pillow Blocks to the clients. We use quality-assured steel and modern methodology for the fabrication. Also, the professionals ensure that entire production cycle is maintained and adhere to industry quality standards. These blocks are made also made available in customized options for the clients. Apart from this, the provided blocks can be availed in bulk from us at minimum rates. Split construction allows for easy assembly and disassembly. Pry tool slots and the exclusive Pry-Lug fulcrum simplifies bearing inspection, service and replacement. Caps are removed quickly and easily, preventing damange to the bearing or housing. 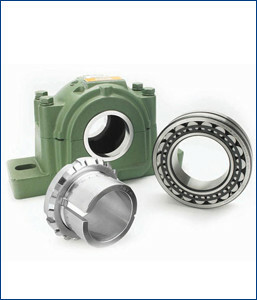 Integrated housing and bearing design enhances unit lubrication characteristics. Multiple sealing options protect against contamination.